Periapical cyst, apical periodontal cyst, or dental cyst. Related to the apex of non vital tooth or related to lateral canal. cyst formation occurs as a result of epithelial proliferation, which helps to separate the inflammatory stimulus ( necrotic pulp ) from surrounding bone. Asymptomatic, unless associated with infection or intra-cystic pressure. Swelling of the jaw is the chief complaint. Soft fluctuant swelling, bluish in color beneath the mucosa. On palpation may feel bony and hard unless if bone resorption occurs thus it feels soft and rubbery. Occurring in 3rd to 6th decade. 60% in Maxilla Canine or incisors. 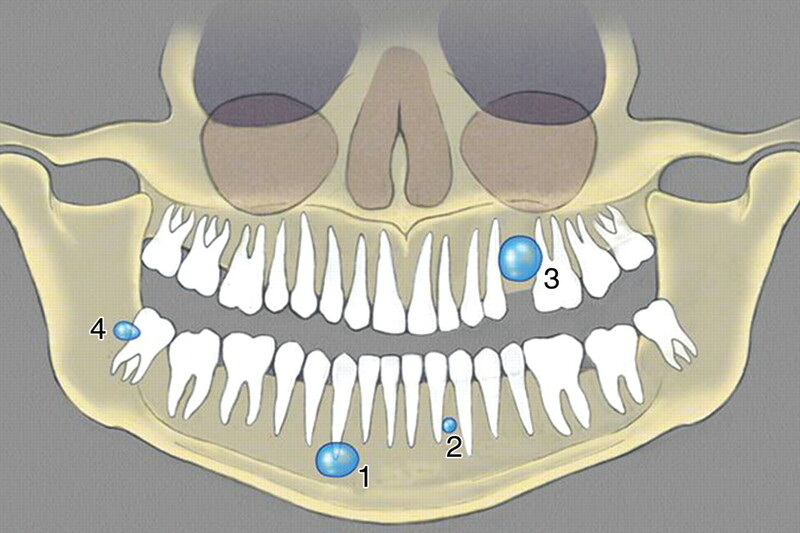 Location apex of a non-vital tooth, but occasionally on the mesial or distal of the teeth. Cannot be differentiated from periapical granuloma. 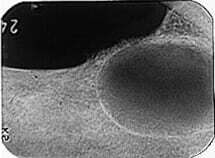 Radiolucency ( round or ovoid ) with narrow, opaque margin that is continuous with the lamina Dura. Root Resorption of offending tooth and occasionally the adjacent tooth. Stafne’s developmental salivary gland defect. Extraction of the associated non-vital tooth and curettage of the apical zone. RCT may be performed with an apicoectomy ( direct curettage of the lesion ). The most often used is only RCT, since most periapical lesions are granulomas and resolve after removal of the inflammatory stimulus ( necrotic pulp ). Surgery ( apicoectomy and curettage ) is done for persist lesions, presence of a cyst or inadequate RCT. Residual cyst may occur if the cyst lining incompletely removed. 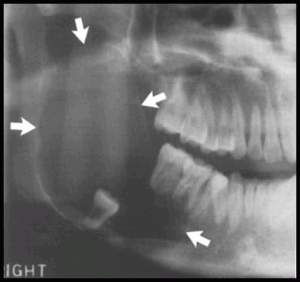 Asymptomatic and often is discovered on radiographic examination of an edentulous area. 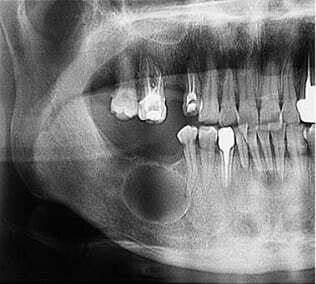 Radiographically it will seen as a radiolucency of variable size at the site of a previous tooth extraction. Often in the mandible and always above the inferior alveolar nerve canal. Periphery and shape. cortical margin shape is oval or circular. complete removal of the cystic lesion ( enucleation ). In large cyst; Marsupialization is achieved by creating a window to evacuate the cyst and to decrease the intracystic pressure. Refer to Article to explain the Difference between. Usually related to a vital tooth. 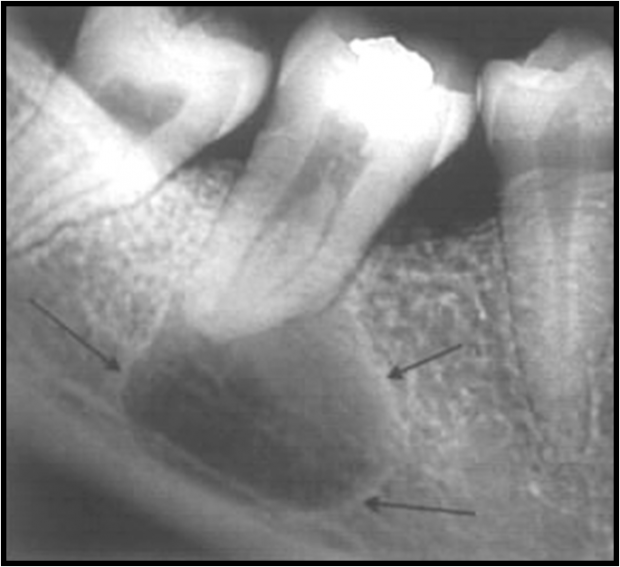 Proliferation of rests of dental lamina. It is rare, mostly seen in males over 50 years of age. Gingival cysts in adult are histogenetically and pathologically similar. Mandibular premolars and bicuspid region and occasionally in the incisors areas. 4th and 5th decades of life most effected. Unilocular radiolucency with opaque margin along the lateral surface of a vital tooth root. a radicular cyst at the foramen of a lateral (accessory) pulp canal. Local excision is generally curative. In case of multilocular ( botryoid ) cyst seems to have recurrence potential, follow up, therefore suggested for treated multilocular odontogenic cyst. Solitary nodules on the crest of the alveolar ridge of the new born or very young infants. it appears as a multiple, small, firm, white or grayish-white nodules on the alveolar ridge . 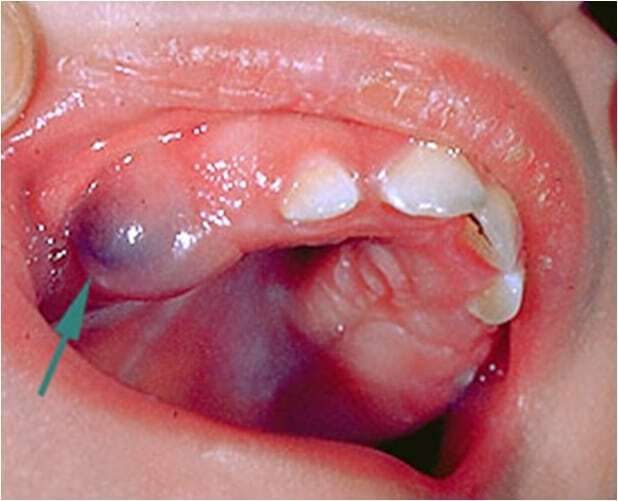 Epstein´s pearls are cystic nodules found on the hard palate or at the junction of hard and soft palate. No treatment is necessary, because spontaneous rupture usually occur early. A small developmental cyst of the gingival tissues derived from the remnants of dental lamina. It appears as a small circumscribed painless swelling, same color as the color of the gingiva. 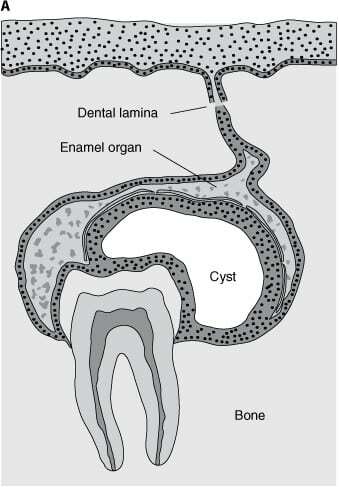 Dental lamina cysts are found only on the crest of the alveolar mucosa. Histologically, these lesions are different because they are formed by remnants of dental lamina epithelium. They may be larger, more lucent, and fluctuant than Epstein pearls or Bohn nodules and are more likely to occur singly. Dentigerous Cyst is one which encloses part or all of an unerupted crown of a tooth. 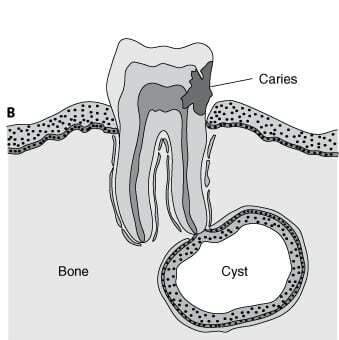 It is attached to the junction where the tooth enamel meets the root (amelocemental junction) and arises in the follicular tissues covering the fully formed crown of the unerupted tooth. Arise from reduced enamel epithelium of the dental follicle of an unerupted tooth. Attached to the tooth cervix ( ECJ ). Enclose the crown of unerupted tooth. Associated with 3rd molar and maxillary canine; mostly IMPACTED. Well-defined, unilocular or occasionally multilocular Radiolucency. The unerupted tooth is often displaced. n the mandible the RL may extend to the ramus or to the body of mandible. In maxillary canine region the cyst may extend into the sinus or to the orbital floor. Resorption of adjacent tooth root maybe seen. Extraction of the tooth and enucleation. Marsupilization of the cyst to allow for decompression and subsequent shrinkage of the lesion. The eruption cyst is the soft tissue analogue of the follicular cyst. 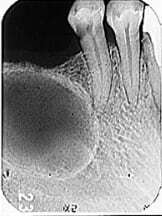 Result from fluid accumulation within the follicular space of an erupting tooth. The epithelium lining this space is simply reduced. It appears as soft fluctuant blue to dark red mass on the alveolar ridge in place of any erupting tooth, particularly molar and canines. Negative as it is soft tissue cyst above the crown of unerupted tooth. No treatment is needed, because the tooth erupts through the lesion, the cyst disappears spontaneously without complication. Arises from reduced enamel epithelium, dental lamina rests and malassez rests. May exhibit aggressive clinical behavior. Associated with nevoid basal cell carcinoma. It can be found any where in the jaw. Highly recurrence after initial surgical intervention. characterized by keratinizatoin and budding cyst lining. Has a wide age range but there is a peak incidence in the 2nd and 3rd decade with a smaller peak in the 5th decade. The cysts are more common in males and 70% occur in the wisdom tooth and ramus region of the lower jaw. Can Reach Large sizes without causing expansion, because it predominantly enlarges anterior-posterior direction. Oral – multiple odontogenic keratocysts, cleft lip or palate. Well-circumscribed Radiolucency with smooth radiopaque margins. Multilocular most common in large lesions. It may cause buccal expansion. It may cause displacement of roots or IAC. 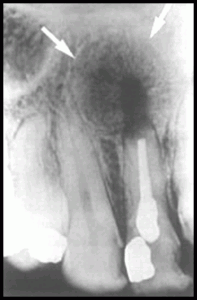 Resorption of the root is common. May be associated with missing or unerupted tooth. It maybe difficult to distinguish from Dentigerous cyst. The cyst is likely to be an OKC if the cyst is connected to the tooth at a point apical to the cementoenameljunction or if no expansion of the cortical plates has occurred. Surgical excision with peripheral osseous curettage or osteoectomy is the preferred method of management. The use of chemical cauterization of the cyst in Highly recurrence cyst has been advocated. In Large cyst; Marsupilization, followed by enucleation, may be an attractive alternative. Thin and fragile cystic epithelium. Has satellite cysts (daughter cysts). Epithelial lining has intrinsic growth potential. 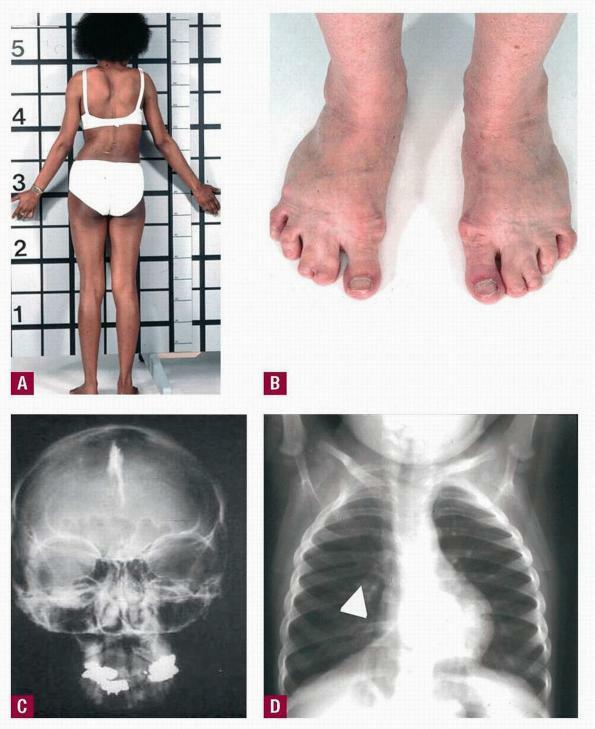 Patients with nevoid basal cell syndrome have particularly tendency for recurrence of keratocysts. Most common site of occurrence is the front region of the lower jaw. They present as slow-growing, painless swellings. The cyst has a potentially aggressive, locally invasive nature. Arises along partly erupted wisdom teeth that is involved by pericoronitis. Mostly in the lower jaw. Ibn Sina University Curriculum By Dr. M. Shanbari. 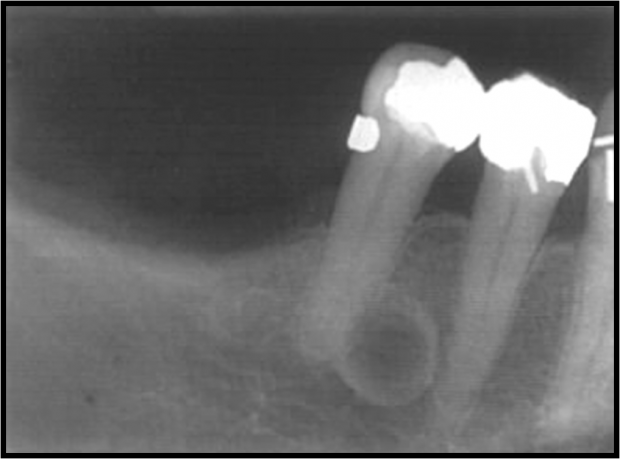 INTELLIGENT DENTAL RADIOGRAPHIC APPEARANCE OF CYSTS PART 2 by Dr. MEIFONG.